Kiroseiz Three Corners, Peace Road Naama Bay Sharm el Sheikh Egypt. Sharm El Sheikh lies at the southern extremity of the Sinai Peninsula in Egypt, a land of towering mountains, verdant oases and flat desert expanses that meet the clear waters of the Red Sea at the golden beaches of the 'Red Sea Riviera'. Developed for its spectacular location, Sharm El Sheikh is world-famous for its coral and aquatic wildlife with magnificent reefs just offshore, considered to be among the top five diving and snorkelling sites in the world. Naama Bay is a haven for the family and those who enjoy water sports: windsurfing, snorkelling, pedallos, para-sailing and trips in glass bottom boats, from which you can gaze at the mountains of coral, swarming with tropical fish. Then there are safari trips, excursions to the evocative landscape of the Sinai Peninsula, trips into the desert at dusk to dine out under the large starlit skies. Built in two-storey residential clusters all 702 guest rooms, suites, apartments and studio's are equipped and decorated to the highest standards, each with its own terrace or balcony with a view on the pool or the stunning surrounding landscapes. Designed to deliver its guest pure excellence the Kiroseiz Three Corners Resort is also a top choice for mixing business with pleasure. All standard rooms are spacious, well equipped and tastefully decorated. With balcony or terrace, they offer attractive views of the gardens and mountains. Individually controlled air conditioning/heating units, satellite TV, telephone with internet access and bathrooms with shower and hairdryer. Twin bedded or with 1 king size bed. Twenty of the standard rooms can be interconnected. Two rooms offer special amenities and are available for people with a disability. Facilities are equal to standard rooms. Twin bedded or with 1 king size bed, plus one or two single beds. 32 family rooms have an additional kitchenette. These apartments feature a king size bed and spacious living room with sofa corner, dining table and large balcony or terrace with view over the pool or mountains. Facilities include satellite TV, Telephone with Internet access, and kitchenette with hot plate. Bathrooms offer shower stall, and hairdryer. These apartments feature a living room with sofa bed and 2 bedrooms. One of them with king size bedroom, the other is with 2 twin beds and bathroom with Jacuzzi. Other facilities include individually controlled air conditioning units, satellite TV, telephone with internet access, full length mirror and hairdryer. Featuring two bedrooms, a living room, kitchen and spacious balconies, Kiroseiz Three Corners Sharm El Sheikh Select suites are ideal for family holidays where space, privacy and comfort are on top of the list. Bathrooms offer shower stall, and hairdryer. These suites are individually furnished, and offer exquisite comfort in a relaxed atmosphere. They feature a king size bed and spacious living room with sofa corner, dining table and large balcony or terrace with view over the pool or mountains. Facilities include satellite TV, Telephone with Internet access. Bathrooms offer shower stall, and hairdryer. The 22 comfortable beach bungalows, in a round or square groundplan, are situated on both sides of a promenade that directly leads to the beach. Each bungalow has an own private terrace with an absolute sea view where you can enjoy each day again the stunning sunrises or sundown's. The bungalows are furnished in contemporary style and key features include air-conditioning, security safe, satellite TV, mini fridge, I.D.D. telephone and bathroom with shower. In Kiroseiz Three Corners Sharm El Sheikh All inclusive Systems - services vary according to the different resorts -, everything's included from fabulous gourmet meals, anytime snacks and drinks. So indulge in every imaginable whim as freely as you choose, as often as you want. because when it comes to providing the ultimate vacation, only The Three Corners can do it. The art of cuisine receives the highest emphasis at the different à la carte restaurants. The Chez Pascal Restaurant offers an authentic Belgian cuisine with a choice of steaks cooked to perfection, seafood and lobster dishes. The Dolce Vita Restaurant focuses on a traditional Italian and gourmet menu selection, which includes pastas, pizza's and delicious desserts. The Mizo restaurant blends Japanese, Thai, Chinese and Vietnamese ingredients with contemporary presentations to create dishes that are perfect to share. The Bukhara Restaurant brings a fine authentic Indian cuisine and a great choice of menus. Enjoy Kiroseiz Three Corners Sharm El Sheikh DineAround program and taste of everything Kiroseiz Three Corners Sharm El Sheikh restaurants have to offer. Casual: no beach or swim ware; for man: long trousers and shirts with sleeves. • Dolce Vita: à la carte Italian Restaurant. During day time the restaurant serves in snack style light food, pizza’s, salads bar etc. During the night time fine dining setting. A successful business conference depends on high tech meetings and communication facilities and on a professionally trained staff ready to attend to participants needs. Kiroseiz The Three Corners Resort offers both and is the Three Corners' premier business destination. The resort offers a full range of conference and catering facilities, including meeting rooms, banquet hall, communications services and computer support. The conference room can accommodate up to 250 seat capacity in theatre style and offers large and technological facilities. The resort even has two cinema halls for each 150 people to support your multimedia needs. The Kiroseiz Three Corners Resort is also a top choice for mixing business with pleasure. A passion for fun is easily indulged in the two freshwater swimming pools and the resort's private beach. You can join in the activities organised by Kiroseiz Three Corners Sharm El Sheikh animation team or enjoy the facilities at your own leisure, it's your break: your choice. Kiroseiz Three Corners Sharm El Sheikh animation team offers a full week schedule for your entertainment. Do sport and besides have a lot of fun! That activates body and soul and releases new energy. 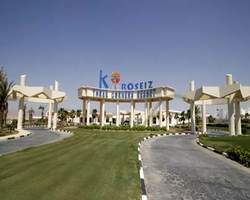 Kiroseiz Three Corners Sharm El Sheikh professional animation team offers an exciting daily schedule of games, recreation and different sports offers. Kiroseiz' waterpark is an ideal escape for both parents and kids, offering an environment that allows for both bonding together-time and safe, kid-friendly fun that gives parents time to relax with children in sight. The features are designed to have 100 percent visibility so parents can keep an eye on their children and easily see them from every angle. Kiroseiz Three Corners Sharm El Sheikh Waterpark offers safe splashy water fun with water attractions that are both slow enough for Kiroseiz Three Corners Sharm El Sheikh youngest visitors. The park is fitted with soft slides, an octopus, water mushrooms and geysers. All attractions are in shallow water and provide a great environment for the children and a chance to live their own adventure in this truly colorful water world. Be sure to bring a waterproof camera to capture the delight on your children’s faces when you join them in the excitement of being a kid again!